Find my Friends is a really great idea and it’s baked right into iOS, the problem is the experience could be so much better, and it’s so hidden that nobody really knows it exists. Most confusing of all is that there is both a stand-alone Apple-made app called find my friends on the App Store which does not come installed by default, also the same functionality is baked in to the OS, but in the most convoluted location you can imagine inside the messages app. Fundamentally the Find my Friends feature is fantastic and can be set to share for just an hour, the rest of the day or indefinitely. I share my location indefinitely with a select few people including my life partner and my business partner. People who I’m arranging to meet in the evening — and it looks like I’m either not going to be on time or it might be difficult to find each other — I shall share with for just an hour. I would share for a day in the scenario where we are at a event and may needs to split up several times and find each other again. • Select a conversation with someone you’ve already sent a message to. 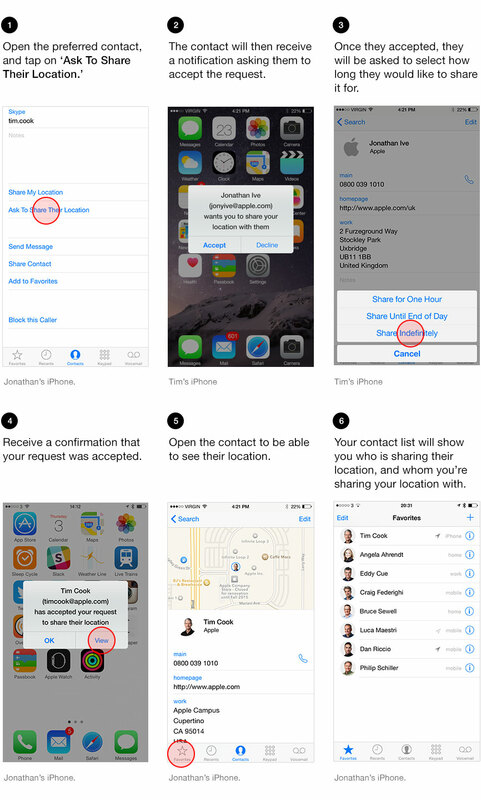 • For you to see other peoples locations your friends on iOS devices must follow the same steps with your contact. • Select a conversation with someone you’ve already sent a message to and has shared their location with you (you must know this in advance). • Assuming they accept, their location is shared based on the timescales they choose. 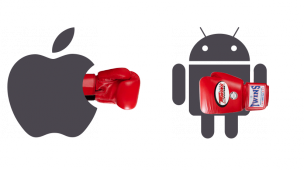 • The notification system is handled by email – the invited user gets an invite with a call-to-action to accept, this kicks either into the open app if installed, or to the App Store if not. The app has the added benefits of the notification functionality; this can let you know if the contact either leaves or arrives at a certain location geofenced within a custom radius. For example I could set a reminder to trigger if my partner gets within a mile of home so that I may have a drink ready for her when she arrives. The app provides a much simpler process, but why does this app need to exist? It seems unnecessary to make an app just to simplify something that already exists in the OS but is badly designed. 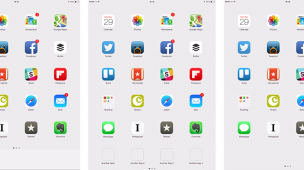 To follow is an idea for how I’d like to see the feature better integrated into iOS. Here’s how I would like to see this implemented inside of iOS, natively. 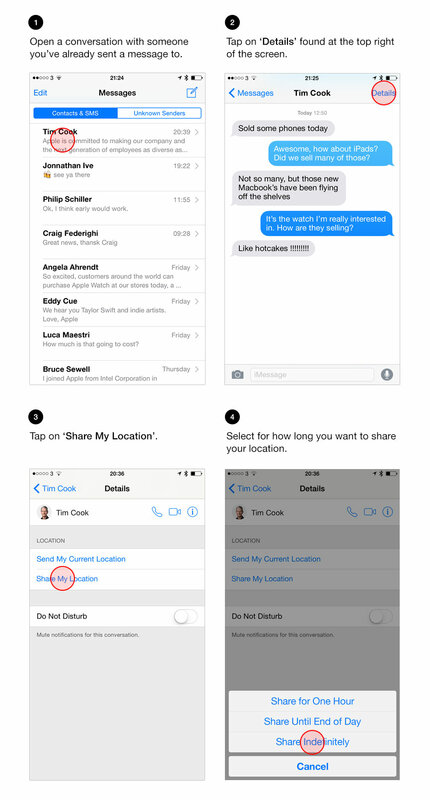 On everybody’s contact card an option could display to read ‘Request to share location’ providing they have a valid Apple ID. 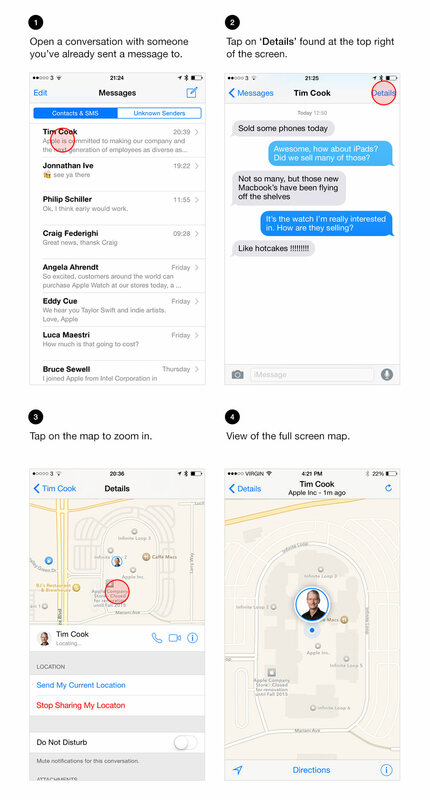 In the same way as in the Find my Friends app the contact receives a notification asking if they would allow their location to be shared. Once granted the first option would be for said user to specify the amount of time they would like to share their location; one hour, the rest of the day, or indefinitely. Assuming the request was granted the requester can be notified of this fact so that they can make use of the functionality in the given time window. 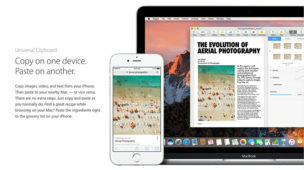 Following this a reciprocal question is posed to the contact who granted their location access asking if they would like to make the same request back to the original requestor. Any contacts with whom this is been enabled should display a location icon next to the name in all contact list scenarios. Tapping this icon takes you straight to a full screen view of that contacts current location with options to adjust the share settings or navigate to their location. This functionality could additionally be extended into both Siri and more importantly into the Apple watch. 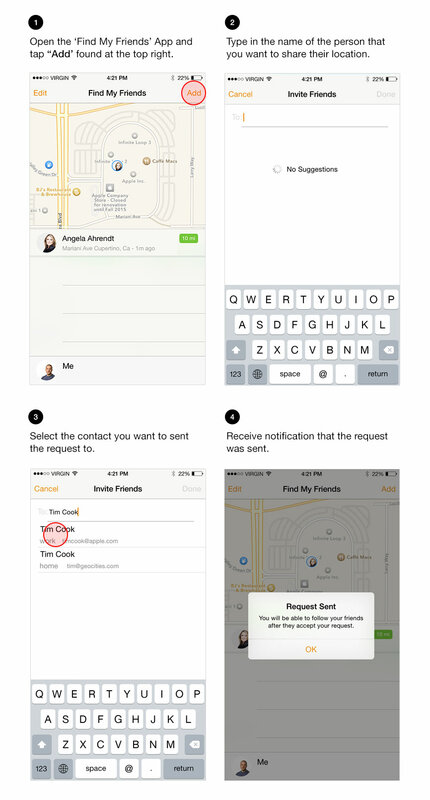 Currently on the iPhone —assuming location permissions are enabled— you can ask Siri to find <contact name>. Trying the same thing with Siri on the watch however just hands this off to the phone. 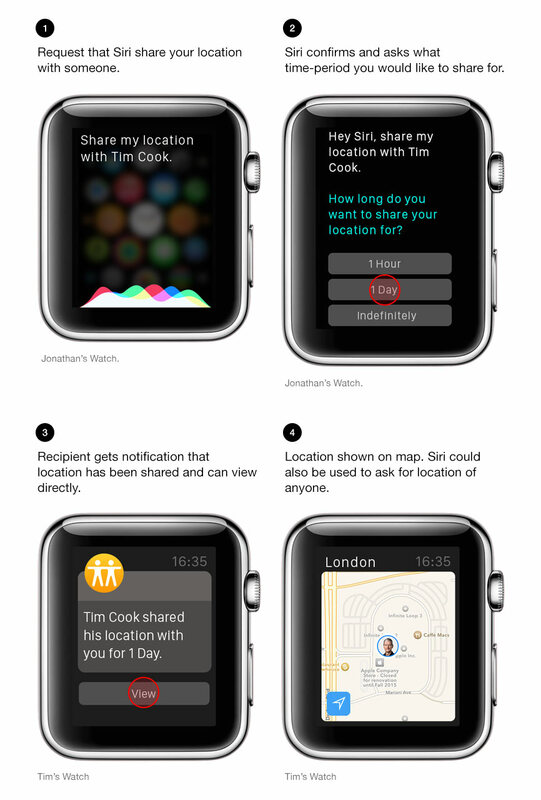 What would be great is if you could both share your location from the watch and also locate friends by taking their current location directly into maps in order to navigate yourself to them – all using Siri. Walking directions on the watch are incredible and this functionality would be particularly useful if you are meeting someone in a new location. I currently use the find my friends functionality most days. Being such a major part of my the daily interactions I would love to see it evolve into a more integrated and useful feature. Admittedly it’s not for everyone. It takes a lot of trust (especially to share indefinitely) but you are always in complete control and as long as you trust those with whom you share your location there is no issue. I hope Apple extends and further integrates this functionality into their operating systems in a more usable and accessible manner in future iterations of the OS.